3g of once-daily fosfomycin for 1 week followed by 3g every 48 h for 6 to 12 weeks is a safe and effective therapy for chronic bacterial prostatitis. A recent report published in the American Journal of Case Reports describes a rare case of drug reaction with eosinophilia and systemic symptoms (DRESS)-induced agranulocytosis in a patient treated with the beta-lactam antibiotic oxacillin. Once-daily plazomicin was noninferior to meropenem for treating complicated UTI and acute pyelonephritis caused by Enterobacteriaceae. The FDA has expanded the approval of Avycaz to include pediatric patients aged ≥3 months for the treatment of complicated intra-abdominal infections. 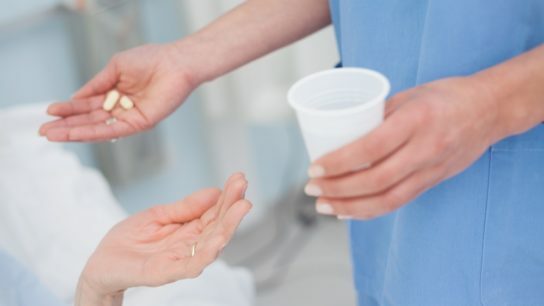 Hospital-based stewardship interventions were associated with decreased fluoroquinolone prescriptions during hospitalization, but not at discharge. A small percentage of microbiologic test results are used to direct the antibiotic stewardship processes. Procalcitonin-guided antibiotic discontinuation was linked with greater rates of survival and reduced antibiotic utilization in critically ill individuals. An antibacterial envelope can reduce the incidence of major cardiac implantable electronic device infections. In patients receiving OPAT, infectious disease follow-up within 2 weeks was associated with a lower risk for all-cause 30-day hospital readmission.